LYNDON B JOHNSON played a crucial role in U.S. achievements in the Space Race with Russia. LBJ Library photo by Frank Muto, 5/28/1959. 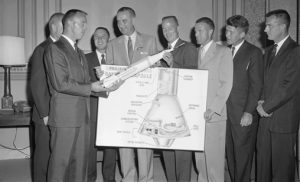 L-R: Alan Shepard, John Glenn, Gus Grissom, Sen. Johnson, Scott Carpenter, Gordon Cooper, Walter Shirra, Deke Slayton, the original Mercury 7. The LBJ Museum of San Marcos celebrated its 10th Anniversary and Fall Lecture Series with a program featuring Dr. George W.S. Abbey, Director at the NASA Johnson Space Center from 1996 to 2001. Lyndon Baines Johnson was primarily responsible for both starting and ending the Space Race with the Russians. In the late 1950’s, LBJ, then Senate Majority leader created a controversy over the USSR’s launch of Sputnik and forced the United States into a public space race that led ten years later to the accomplishment of the first human landings on the moon. The United States had some serious catch-up to do with the Russians and the fear was that the Soviets might claim the ultimate high ground in space. Dr. Abbey spoke about how President Kennedy put Vice President Johnson in personal charge of the space program. It was Johnson’s excellent management that turned things around and led the United States back to the front of the Race for Space. Dr. Abbey’s talk was livestreamed over the internet. A copy of the talk can be reached at: http://www.ustream.tv/recorded/92495532. After Alan Shepard became the first American in Space in 1961, President Kennedy, with Johnson’s support, committed the United State to be the first nation to land on the Moon. Dr. Abbey’s discussion covered NASA’s Mercury, Gemini and Apollo programs with both the gains and setbacks the program encountered. He briefly touched on the Apollo 1 fire that happened in January, 1967 which caused the deaths of three astronauts, Gus Grissom, Roger Chaffee and Edward White during a training exercise and the changes that NASA had to implement in creating new fabrics and interiors that were not combustible in order to protect future astronauts. Dr. Abbey provided some excellent photographs of both the Gemini and Apollo programs including Neil Armstrong and Buzz Aldrin on the Moon in July of 1969 during the Apollo 11 mission. Dr. Abbey also discussed the Space Shuttle program and how the U.S. shut down the funding for NASA. The United States is currently working with Russia to supply access for our astronauts in space and to the International Space station. As Dr. Abbey concluded the evening he spoke about the challenges that we face as a country in educating our youth in science, technology, engineering and mathematics. He predicted that our next effort should be to return to the moon with a moon base and expand our learning for an exploration to Mars. He estimated that it would be 40 years before the world would be able to travel to Mars because of the distance, the need to produce water and fuel as well as protect our astronauts from exposure to radiation. Dr. Abbey’s talk was also livestreamed over the internet. A copy of the talk can be reached at: http://www.ustream.tv/recorded/92495532.